Checkout this collection of the biggest music and audio news and apps for the week. 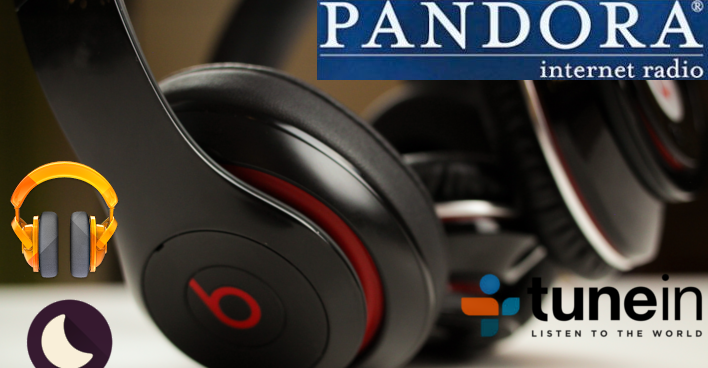 In the news department, we've got a possible acquisition of Beats Electronics, a good deal on tunes in the Google Play Store and Pandora is testing out a new way to make some money. As for those apps, one winds it up and the other brings it all back down to sleepy town, let's check out Spoticast and Doze. We have seen reports suggesting that Apple is in talks to take over controlling shares of Beats Electronics for about $3.2 billion. The maker of the popular Beats headphones has, since 2011 and until recently, been under a 50.1 percent ownership by device manufacturer HTC. HTC enjoyed the relationship, pumping the beats (pun intended) on a handful of Beats powered Android smartphones. That trend came to an end before their latest flagship release, the HTC One (M8), which can now be found as a Harmon Kardon Edition. This would not be the first music related company that Apple has purchased - remember Lala? - leading to fears that Beats as well may be dissolved into Apple's own music products and services. Stay tuned for more on this. TechCrunch tells us that the deal should be finalized and announced next week, if it is, indeed, the real deal. 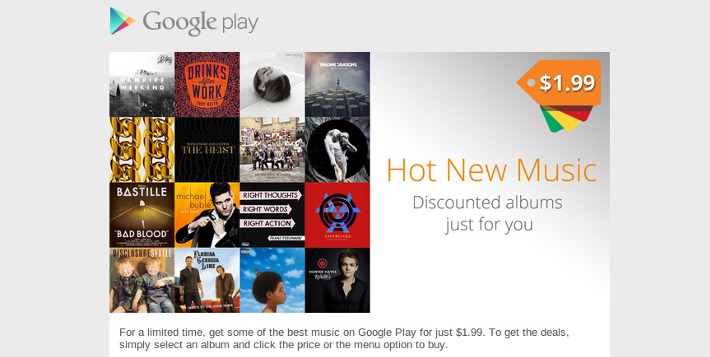 Some lucky Google Play Music users have been receiving an awesome invitation from Google to grab up as many as 5 music albums from bestselling artists for just $1.99 each. We've heard that some users are seeing differing prices in other countries, $1.49 in Canada? Speaking of Canada, you just got Google's Music, how are you liking it so far? This is a limited time offer and appears to be going out to new users of Google's services. Certainly, my account that is all loaded up with tunes and linked to several devices did not get the invite, but I have confirmed that an Android user near me that is not actively using Play Music did get it. Did you get the invite? Pandora has been around for a decade now, providing streaming music to the masses (US only, mostly.) In an intriguing move to gain some sponsorship dollars without having to increase advertisements and/or costs to end users, Pandora is launching Promotional Stations. Early beta promo stations included brands such as Kleenex, Sketchers, StubHub, Taco Bell and Toyota Motor Sales. The brands are given a station each, for which they individually choose the music and advertisements that play. As of May 7th, Pandora will be pushing these promo stations out to just 10 percent of their 76 million active monthly users, with gradual rollout in the coming weeks. Head into your "Stations You Might Like" list to see if you have access to the promo stations. Pro-tip: The Kleenex station is supposedly going to play mostly country songs, look for it, or avoid it, your call. Are you getting tired of hearing about all the new apps and updates that bring Chromecast functionality to your living room? We hope not, and Spoticast is here to add another. 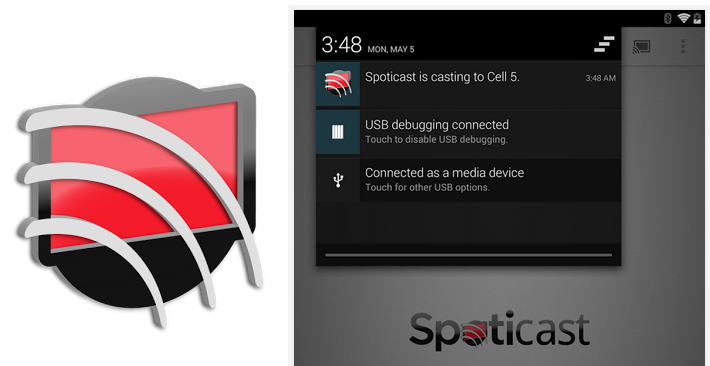 Spoticast, as the name implies, serves up one great purpose, allowing you to crank your Spotify (Premium subscription) tunes on your home entertainment unit. Spotify themselves have no known plans to launch their own Chromecast support, so we have nothing but love for Spoticast. Since Spoticast can only support users of Spotify's paid mobile subscription, it is great that Spoticast is free to download from the Google Play Store. We hear the app is a little buggy, but once you've got it rolling, go ahead and get that party started. Have you had a busy day reading this article and now require relaxing music and ambient sounds to wind down with? 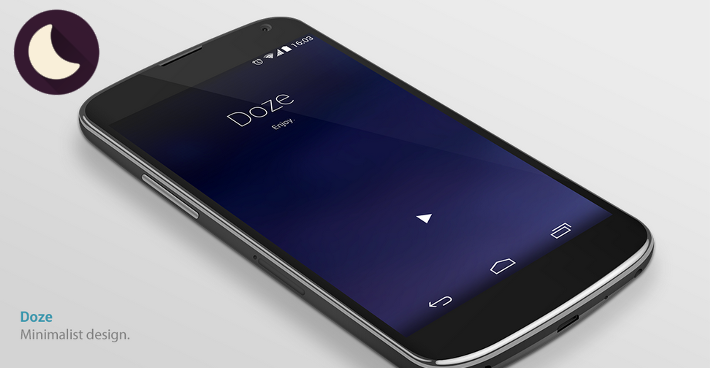 If so, Doze is the app for you. Beautiful in its simplicity, Doze offers infinite streaming of relaxing music and ambient sounds such as slow crashing ocean waves, rain and birds chirping. Doze offers endless advertisement-free playback, just hit play and enjoy. Should you desire Doze's soothing sounds to fall asleep to, make sure to quickly set a sleep setting, which currently offers not an amount of time, but either 3, 5 or 10 tracks before joining you in sleepy town. Interesting enough, I keep hearing noises from within their tracks that could very well come from one of my favorite old noisy apps, Node Beat. Doze is currently in a development stage, so expect some bugs and new stuff to come online as we go, but it is free to grab from the Google Play Store. There you have it, some big news and a couple somewhat niche apps that will have an effect on your eardrums. Get in there while things are free and deals are to be had. Any users of these services take advantage of any of these apps or deals yet? What do you think the next stage in an Apple owned Beats looks like?